Looking for more meatless dishes? 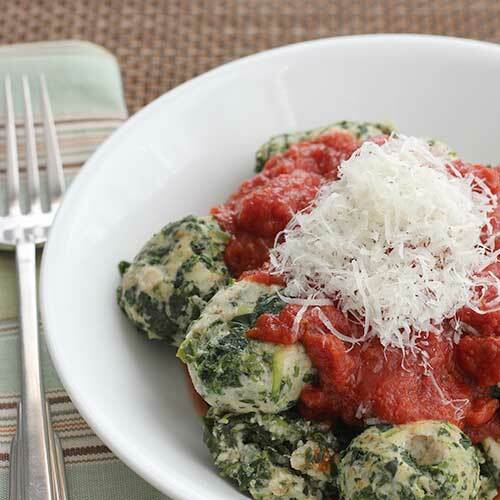 Try these unusual spinach dumplings stuffed with ricotta cheese and Italian herbs. Top them with pasta sauce and you’ll feel like you’re eating meatballs. While the spinach dumpling recipe below may seem daunting, the process is broken up over a couple of days so there isn’t much to be done at any one time. 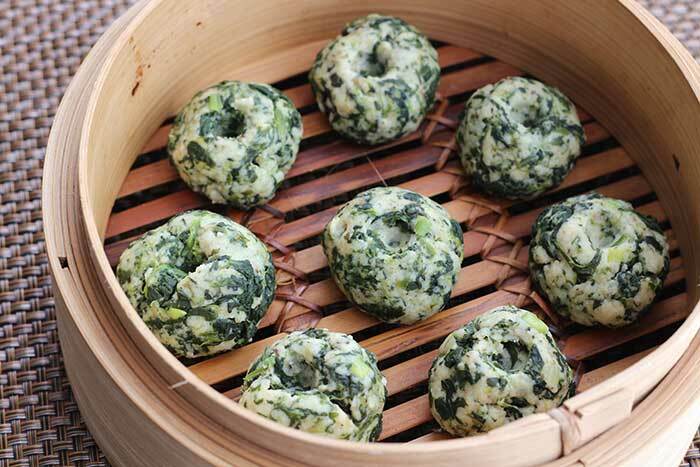 You cook the spinach and mix up the dough one day, then shape and cook the dumplings another. You can even make it a three day process – mix, shape, cook. Get the kids involved too. The original recipe called for boiling the dumplings and I did that first, but some of them fell apart. They were still tasty, but didn’t look great. One day, I had a vision of the dumplings in a steamer basket and knew I had to try steaming them. I could only cook a few at a time this way, but they held their shape beautifully and the CompostMaster said he thought they actually tasted better. You should end up with about 48 spinach dumplings, or 8 per serving. Serve with your favorite tomato-based pasta sauce or make Oven-Roasted Tomato Sauce. Dust with additional shredded Parmesan, if desired. 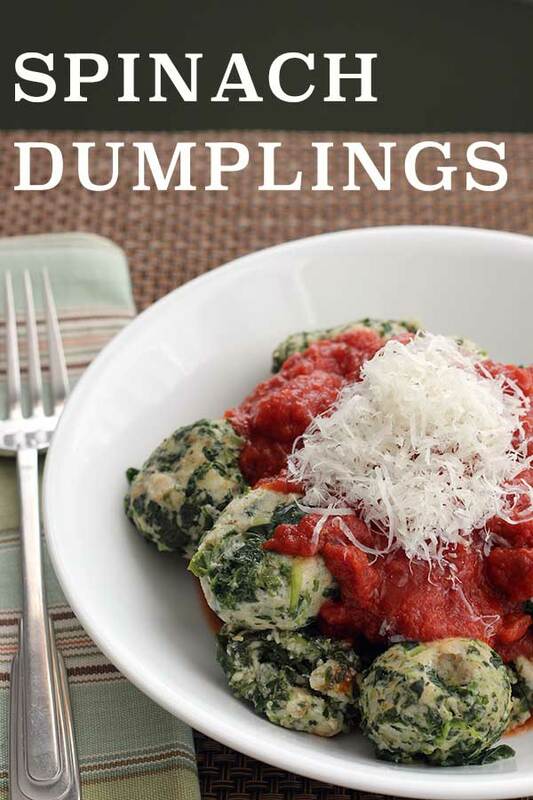 Meatless dumplings stuffed full of spinach, ricotta, Parmesan, and Italian seasonings. Start this recipe 24 hours ahead of time. In a medium saucepan, combine spinach and 2 tablespoons water. Cover and cook over low heat, stirring occasionally, until spinach is completely thawed, about 15 minutes. Drain in strainer and let cool. Place spinach in clean dish towel or cloth napkin. Pull up corners to form a pouch. Twist to squeeze out as much liquid as possible. Set aside. Beat eggs in a large bowl. Add bread crumbs, Italian seasoning, ricotta, Parmesan, scallions, parsley, basil, garlic, nutmeg, and black pepper. Mix well, then add spinach. Mix until spinach is thoroughly combined. Line two baking sheets with parchment paper. Lightly dust with flour. Take a generous teaspoonful of the dough and roll into a ball. Place on prepared baking sheet. Repeat with remaining dough, making sure the dumplings don't touch. Select a saucepan on which a bamboo steamer will fit. Fill it half full of water and bring to a boil. Place dumplings in steamer basket (off the heat), making sure they don't touch. (Lining the basket with cabbage or parchment will make clean-up easier.) If you have stacking baskets, you can do multiple batches at once. Place basket(s) on top of saucepan and steam over high heat for 10 minutes. Remove dumplings to covered dish to keep warm while you steam remaining dumplings. If you don't have a bamboo steamer, you can boil the dumplings. Bring a large pot of water to a boil over high heat. Add half of dumplings to boiling water and reduce heat to medium. When dumplings float to surface, after about 5 minutes, continue cooking for another 4 minutes. Remove dumplings to covered dish with a slotted spoon, draining well. Repeat process with remaining dumplings. Steam or boil? Even though it takes longer, I prefer to steam the dumplings because they hold up better. Serving suggestion: Top with tomato-based pasta sauce such as Oven-Roasted Tomato Sauce. Make-ahead tip: Mix up the dough on Saturday, shape the dumplings on Sunday and refrigerate. Cook on Monday and you'll have a meal on the table in no time. Watching sodium? Prepared bread crumbs are high in sodium. You could make your own crumbs from low-sodium bread instead. Parmesan cheese is also high in sodium, so you might want to reduce the amount you use. Watching fat? Use nonfat or reduced fat ricotta cheese. Gluten-free? Use gluten-free bread crumbs and gluten-free flour. Just wrote down the ingredients to pick up at the store. They sound perfect. Will steam. Thank you.